Approaching the theme from an antitrust perspective and focusing on telecommunications and television broadcasting, this volume examines how traditional European competition law doctrines and principles can be applied to this converging sector. The application of antitrust rules to the communications sector is often one of the most controversial areas of law and policy. The shift towards a more competition law oriented form of regulation is one of the main principles inspiring the recent reform of European sectorial regulation enshrined in the 2002 Electronic Communication Package. The Package was adopted in 2002 and is in the process of being implemented throughout the Union. 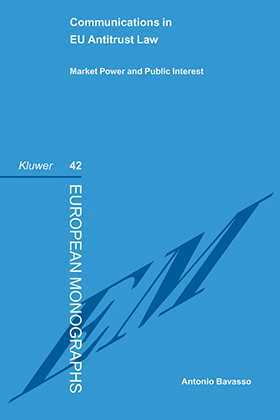 This monograph provides a detailed description of the new regulatory package and highlights the interplay between regulatory provisions and EC competition law. It then follows the pattern of a typical antitrust analysis containing chapters on the definition of relevant market in the sector and various forms of abuses of market power. The book also critically examines the Commission's practice and policy in the field of merger control and considers its relationship with wider regulatory policies. Finally it analyses the sector from the perspective of the "European" public interest and the changed nature of communications as a public service. Market Power and Its Obligations in a Converging Sector. Essential Facilities: The Rise of an "Epithet" and the consolidation of a doctrine. Concentrations, Joint Ventures and remedial Powers: Regulation from the Backdoor?